Isabelle Arvers was at the Centre for Digital Media last week planning Evolution, a game art exhibition happening at CDM this summer. 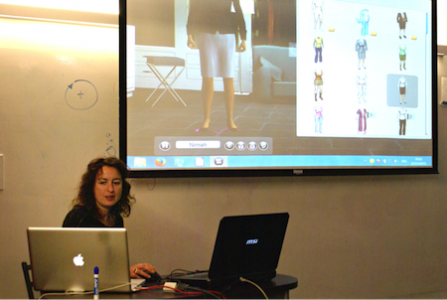 While she was here, Isabelle met with MDM students and ran a machinima workshop, teaching students how to create their own videos using video game graphics. We sat down to chat with Isabelle after her workshop about her exhibitions, the big changes that she’s seen in the digital media landscape over the last 20 years and what we can expect at Evolution this summer. The following is a recent interview with Isabelle Arvers at the Centre for Digital Media. 1. Can you start by telling me a little bit about yourself? What's your background, what do you do? I'm a curator, mostly curating gaming exhibitions. I’m interested in exploring the relationship between art and games through video, art, machinima and music. 15 years ago, I recognized that games were becoming a big part of the entertainment industry and I felt that it was becoming important critically to try and show alternative uses of video games and indie games. Machinima is a good example of taking an object and turning it into a form of expression. 2. How did you get into the world of gaming and machinima? Were you interested in games as a kid? I was really into gaming as a kid but then I lost interest. In 2000, I worked for an online gallery that sold digital art and games online and I was working with game studios to get their games into our library. It was basically iTunes before iTunes but, unfortunately, it was too early and the site didn’t last. But the job helped me get back into games after discovering alternative games and the little studios. 3. According to Wikipedia, you've specialized in new media since 1993. What are the biggest changes you've seen in the new media space over the last 20 years? I think that there have been several big changes over the last 20 years. One is smartphones. I wrote my thesis on digital media and it’s crazy to think that I didn't even mention cell phones because they weren't around yet. Another big change is communication platforms like Skype. I remember being involved in this interactive performance between Paris and New York before Skype and it was amazing to be communicating over different time zones across the ocean. It gave a sense of ubiquity. I look at students now and they see the world as a playground. When I was student you didn't go farther than Europe, and you needed English to get anywhere. Social media is also a big change. User-generated content produces so much value. Another change is the availability of free software and tools. Now if you want to create a game or a website there are so many free tools available to help you out. Lastly, another big change is the availability of platforms. Steam, for example, really helped indie game developers. Now these developers don't need marketing and distribution teams to get their games out there. 4. You have a huge list of exhibitions that you've done—what's your most memorable? Playtime was my first big project. In 2002, it was one of the first retro-gaming exhibitions for gaming and game art. It was huge. We had 36,000 people attend in 3 days. It was a big accomplishment. And then one month ago we did antiAtlas of Borders. I was in charge of production, communication, marketing, and curation. It was a very interesting project because I worked with Nicola Mai and Cédric Parizot, both anthropologists, as well as Anne-Laure Amilhat, a geographer, and Jean Cristofol, a philosopher, and, for once, it wasn’t about gaming. It was about the experience of land, sea, air and virtual borders. It was an amazing project. 5. What work are you doing here at CDM? I’m here doing work on Evolution, a retro-gaming, indie game and art exhibition happening here at CDM this summer. Due to space issues, instead of holding one large event, we're going to make it an annual event the first year with retro-gaming & indie-game exhibitions and then the second year will be about art. I'm very happy with the project and I really like partnering with CDM. I love the energy here at the school and the mix of professionalism with creativity. I also love the size of the building, the people, everything. I’m really excited about the collaboration for Evolution. I'm co-curating the event with Kim Voll and Malcolm Levy and I've really enjoyed working together on Skype. Malcolm really knows the art scene in Vancouver and has tons of experience organizing events and Kim has huge knowledge of the game industry so, between the three of us, it’s a really good collaboration. The exhibit will show how the creativity of games has evolved over the last 30 years and the evolution of graphics, design, sound, and game play. Right now we’re making decisions on how to present each game—some are being screened, some are being set up arcade style, some set up in lounges. We're also planning on highlighting new technology, including the Leap Motion and the Oculus Rift. 6. Can you tell us about the workshop you ran? Yes, I just ran a machinima workshop for the MDM students. I showed them three technologies: a video editor using Grand Theft Auto, traditional technology to record and edit a video from a computer game using a program like Quicktime or FRAPS and then I also showed them how to use the software Moviestorm and had the students made their own videos. A student video created by Carlos Flores in Isabelle’s machinima workshop using Moviestorm. 7. What's next? Any upcoming shows? I'm currently writing a book about game art and machinima with Margherita Balzerani and Part 2 of AntiAtlas of Borders is going to be touring in Italy and Belgium this winter. I’ve also just been asked to present “Machiniglitch” a machinima program at Vector, a game and art festival in Toronto in February. I love it. I love spending my time meeting people and travelling around the world.